Jim and I went by Pink Fog to inspect the steel connections on the stair to the loft. 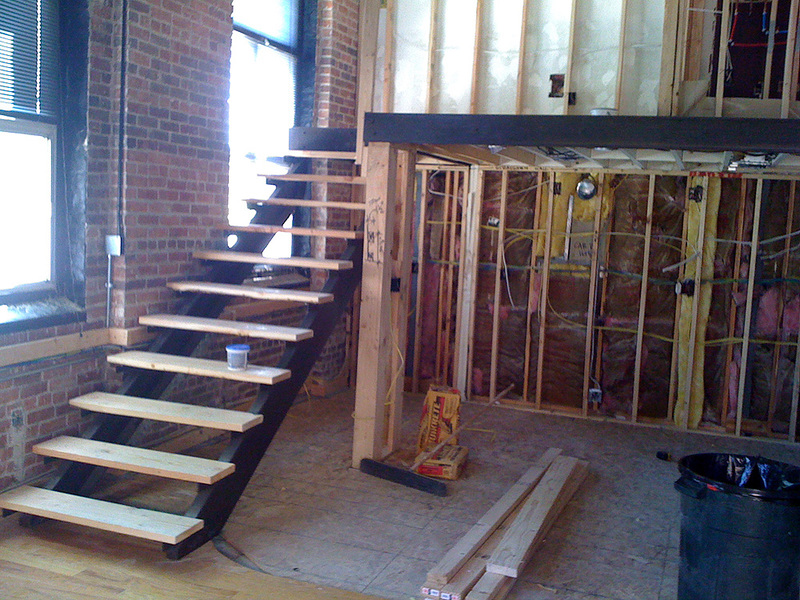 Due to existing conditions, we designed a stair that would avoid placing a post in front of a window. The design required both cantilevered upper floor framing and a cantilevered stringer. In order to make this work, we utilized a unique structural design with a bent frame to handle the torsional force and the cantilevers. All Contractors should be intimately familiar with Steel Reinforcing Bar (Rebar) grades and sizes. With materials coming from all over the globe these days, it is ever important to know the comparison between the Imperial and Metric systems for bar grading and sizing. Starting in 1997, CRSI member steel mills have adopted new “soft metric” standards in their grading and sizing. The charts below should be used to cross reference imperial grades and sizes with metric grades and sizes. Watch out because if your specs are in metric and your supplier is still using the imperial system, you may wind up with some really huge bar diameters on site. As you can see, the old #4 (1/2″) bars are now being called out as #13, so be very careful here to avoid these kinds of potentially costly mistakes. Here are some great resources about the different types of wood trusses and how they are designed. If you have any questions about roof or floor trusses please let us know. It’s often tempting to try to squeeze bathroom spaces when designing a house. A comfortably sized bathroom is worth the extra few inches though. The IRC says the minimum width from the centerline of the toilet to the nearest cabinet or wall is 15″, making 30″ of wall space an absolute requirement for your toilet. It also mandates that you have 21″ clear in front of the toilet. We generally find 36″ of wall space to create a much more pleasant bathroom space, and design our bathrooms to that criteria. We also provide at least 24″ clear in front of the toilet where possible. In master bathrooms, a toilet room/water closet is frequently designed for privacy – generally pushing the walls out another few inches to 42″ will keep the space from being claustrophic, as well as allowing room for the door swing in and room to turn around. At EVstudio we are constantly keeping up with the latest information and tools available to help us work in the most effective way possible. I’ve just had the opportunity to check out a brand new website called LEEDuser.com offering a comprehensive new tool which could be a valuable tool for even the most seasoned of professionals when working on a LEED (Leadership in Energy & Environmental Design) certification project. The site has been created by the same people who created BuildingGreen.com with the help of leading national and international green building experts such as YRG, Fore Solutions, Dan Ackerstein, Flack + Kurtz, AEC, EDAW, Viridian, & Geiler & Associates. One of the best things about the web-site is that it is built around the recent 2009 changes to the LEED 3.0 Rating Systems creating a free opportunity for those of you who haven’t been able to attend a local seminar or haven’t wanted to dedicate the time or money yet to learn about the changes from LEED 2.2 to LEED 3.0. Although they don’t yet have information on every pre-requisite and credit available through the LEED Rating Systems, they have started with some of the most difficult, tricky or misunderstood of the LEED credits and the information offered for each of these credits is phenomenal. The site is very user friendly and easy to navigate and includes information about the new Regional Credits, green building strategies such as Daylighting, Green Roofs and Porous Paving in addition to very in-depth information, tips from the experts and resources for each of the credits that are currently available on the site. It also acts as a very useful portal to finding the peripheral information necessary for navigating a LEED certification project such as links that lead you directly to where you can find the information for ASHRAE Standard 90.1 – 2007, for example. Interestingly enough, in addition to the nationally applicable information, there seems to be quite a bit of regionally specific information based on real world experience stemming from the collaboration with YRG and the other experts and the municipalities & jurisdictions that they are familiar with. For example, a link to the Denver Water Quality Management Plan is included in the resources available for the Sustainable Sites – Stormwater Quality Credits resources, in addition to a list of other such resources. There is an incredible opportunity to strengthen this type of regionally specific real-world knowledge through a built-in feature of the site which is a field for comments within the pages for each of the credits. This tool has the blog-like potential to become a very powerful resource for users that will allow them to ask questions of their peers and share real world information and experience on LEED projects specific to each region, LEED credit & sustainable strategy. Just another quick bit of information courtesy of our friends at RSmeans. With wildly fluctuating costs of building materials, it’s more important now than ever to keep your finger on the pulse of these costs as they move. Note too that costs range for different markets. The median for concrete hovers right around $110 per cubic yard. Note that this is plain concrete with no admixtures or specialty additives in the mix. The cost of concrete has risen continually during all of 2008 and the first quarter of 2009 of about 4% annualized. According to RSMeans, there are indications that the price may hold steady or possibly drop for the remainder of 2009. With the use of nail guns set too high and the speed of construction, many nails are over driven. Most building officials don’t seem to notice or comment on this error. But, if they do you might have a lot of work ahead of you to add correctly placed nails or staples when the nailing is too close for additional nails. Before you start adding nails or staples consider that additional nails may cause more harm than good. If the specified nailing is at 4″o.c. or less, adding more nails can damage the sheathing and studs, reducing the shear wall capacity more than if the additional fasteners were not used. APA addressed this problem and issued a simple breakdown on when you need additional fasteners or not. Please visit www.apawood.org for additional information and other useful technical bulletins. You are currently browsing the archives for the Building Technology category.